I don’t feel that way. In fact, I love working with middle schoolers precisely because they’re changing so fast. Yes, they may seem to be in turmoil, but that’s because they’re beginning to think for themselves, to become more open to ideas, to explore their own identities, and to see connections between their lives and the larger world around them. Rather than fearing this volatile phase in children’s lives, we should embrace it as an exciting time of physical, intellectual and emotional metamorphosis and growth. In fact, the same behaviors and emotions of middle schoolers that can sometimes make dealing with them so challenging, are not obstacles but opportunities. Their inherent energy, curiosity and passion can be guided and nurtured to help them become thoughtful, confident and independent young people. Middle Schoolers love to be active. They sprint, spring, shove, jostle and lurch. Impulsive and impatient, they often can’t sit still. Middle school teachers capitalize on this kinetic energy by devising hands-on classroom activities that provide opportunities for students to move around, construct projects, and interact with one another. This might involve building a volcano in science, creating a human timeline in history, or acting out a scene from a play in English. Such “learning-by-doing” enterprises provide middle schoolers with more leeway, responsibility and mastery, equipping them with skills such as initiative, creativity and self-direction. Both parents and teachers can build on this curiosity by challenging students to explore new ideas, discover alternative ways to solve problems, or go off the beaten track to investigate a topic that fascinates them. 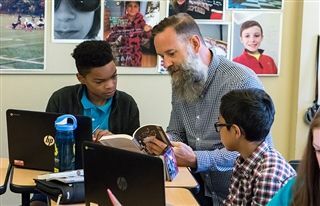 By pursuing new subjects and ideas, middle school students are making the natural and exciting transition from literal to abstract thinking and drawing connections between many different realms. Their minds are exploding with scintillating ideas they’ve never considered before. From this intoxicating experience, they imbibe a lifelong love of learning. Yes, it’s true. Middle schoolers are emotional, often veering instantaneously from blissful elation to blubbering dejection. Sometimes they’re able to restrain their emotions at school, but, upon returning to the safer environment of home, they let their feelings fly as they defy, disrespect and disregard their parents. Middle schoolers are discovering their identities and, in the process, trying out different kinds of faces to figure out which one feels right. That’s why they’re sometimes laughing themselves silly at a goofy video and the next minute having a serious conversation with you about the international refugee crisis. This emotional volatility is completely normal, and it’s important that parents and teachers show patience and embrace the valleys as well as the peaks. These sudden mood swings are natural twists and turns on the long road to maturity. Because KO is a grade 6–12 school, I’ve been able to follow many of my former middle school students as they progress in their careers at the Upper School. It’s a moving experience to watch a student who struggled through moments of doubt, insecurity or impulsiveness at the Middle School stride across the graduation stage as a confident and capable young adult. As a Middle School teacher, I’m extremely proud to have played a part in that process.